CWRU undergraduates including second-year Weatherhead finance major Evan Harris earn over $100,000 in funds for developing a foot-pedal generator for off-grid villagers. Last night while you slept, your iPhone 6 dutifully charged itself, plugged into the wall outlet, which is wired to an electricity source provided to you by your local electric company, which sends its juice uninterrupted and without you even thinking about it through its miles and miles of cable, from…the place where the elves bang cymbals of lightning together to manufacture electricity, don’t you know. Wherever it comes from, it arrives bright, abundant, and instantaneous. In other parts of the world, however, a person travels 20 hours round-trip just to charge a cell phone. Undergraduate students at Case Western Reserve University have teamed up to develop a solution to this problem: a foot-pedal generator that will provide enough power to charge a phone after about two hours of non-continuous pedaling. The average African family of five, for instance, could easily charge a phone using the foot-pedal generator and save themselves 18 hours of travel time. Forget relying on elves to bang on cymbals of lightning to generate electricity; off-grid villagers will have access to power directly through their own feet. The team that developed this concept is comprised of second-year students, Sam Crisanti—mechanical engineering major, Ian Ferré—mathematics major, and Evan Harris—Weatherhead finance major. Crisanti and Ferré first developed the concept for their project during the fall of their freshman year in Engineering Design for the World’s Poorest. Daniel Lacks, PhD and C. Benson Branch Professor of Chemical Engineering, encouraged the students to apply for a grant in lieu of writing a final paper. Lacks has served as their faculty adviser ever since. Harris plays an integral role in the three-person startup company GreenLite Technology. He joined Crisanti and Ferré in the spring semester to run the business aspect of the company. He is responsible for realizing the commercial potential of the product by developing partnerships with key people around the world, creating adaptive business strategies and establishing a unique supply chain. Since the 2014 spring semester, the team has garnered significant recognition for their work, receiving over $100,000 toward their project thus far. This includes an EPA Phase I grant ($15,000), placing fourth out of 77 teams in the final round of the Carnegie Mellon University Venture Challenge (behind teams from Princeton, Harvard and Carnegie Mellon), third in the Great Lakes Energy Institute (GLEI) competition, second in the CWRU IdeaLabs 2015 competition ($500 prize), and first in the 2015 CWRU Spartan Challenge ($10,000 prize). 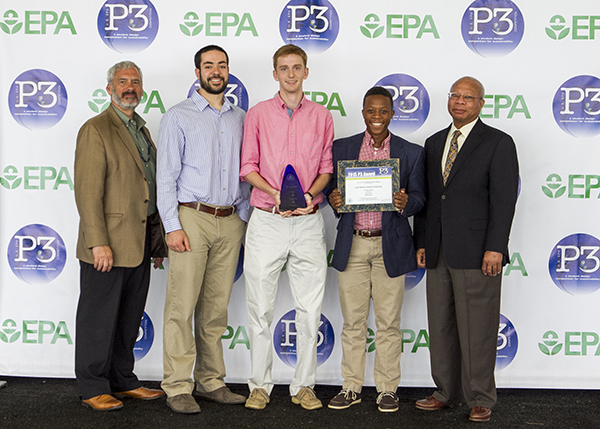 GreenLite Technology recently competed in the U.S. Environmental Protection Agency's P3 (people, prosperity and planet) competition in Washington, D.C. They were one of seven winning teams and received a $75,000 grant for further work. The team will use this funding to continue rapid prototyping and beta testing and to travel back to Africa and the Philippines for in-country analysis. “I have always had a strong interest in social entrepreneurship,” says Harris, “so I see this as a great way to do a lot of good and get a lot of experience.” The team envisions developing other prototypes by the time they graduate, such as a hiking pedal, a pedal for disaster relief areas, and a standard pedal for a family). For now, the team is hard at work achieving functionality in their newest prototype, conducting market research in order to understand the economics and cultural factors in Africa, and entering more business competitions to amass additional funding. For more information, please contact Evan Harris, 216.536.6121 or email ejh103@case.edu. Faculty investment in individual students and world-changing, hands-on, cross-school collaborative opportunities like this one are commonplace at Weatherhead School of Management. Learn more about our undergraduate programs that challenge students to think beyond the possible.